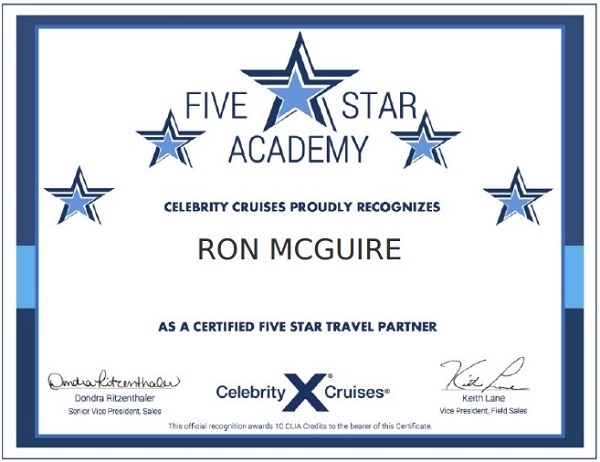 Ron McGuire recently became a Celebrity Cruises Certified 5 Star Travel Graduate after completing five stages of training and testing. Congratulations! Background: Born in Glasgow, Scotland. Travelled all over the U.K, Camping at the very north John O’ Groats, and the very south Land’s End. Have worked for Shawn since 1998 and was one of the first 100 travel agents in North America to become a Princess Commodore in November 2006 and then became a Cunard Commodore in 2008. I became the first Travel Agent on Vancouver Island to become a C.L.I.A Elite Cruise Counsellor in 2007. I love to travel as often as affordable, and I love to hear the sound of the ocean as I go to sleep. My advice to everyone is to travel while you are healthy enough to enjoy it, I do! Qualifications: C.L.I.A Elite Cruise Counsellor, Princess Commodore, Cunard Commodore, completed specialist training courses for Crystal Cruises, Azamara Club Cruises, Regent Cruises, Oceania Cruises, Seabourn Cruises, Holland America, NCL, Celebrity Cruises, Paul Gauguin Cruises, Ama Waterways, Avalon, Viking, Uniworld. Interests: Ocean, River and Luxury cruising, food & wine of course, all inclusive resorts, beaches and historical buildings. Destinations: U.K., USA ,France, Hawaii, Italy, Spain, Portugal, Turkey, Gibraltar, Monaco, Caribbean, Colombia, Venezuela, Nicaragua, Guatemala, Honduras, Costa Rica, Panama, Mexico.